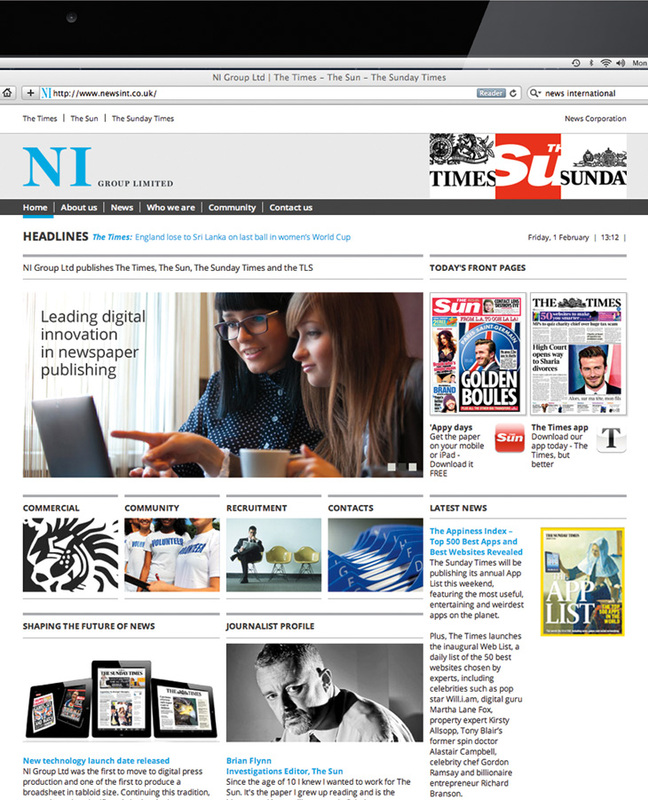 Recently launched website for News UK promoting their state-of-the-art media studios, now available for public hire. Website for Williams Harlow, a leading independent firm of estate agents with offices in Banstead and Cheam villages, Surrey. The fully responsive site is specially built to pull in the Vebra Alto estate agency software for searches and property details. 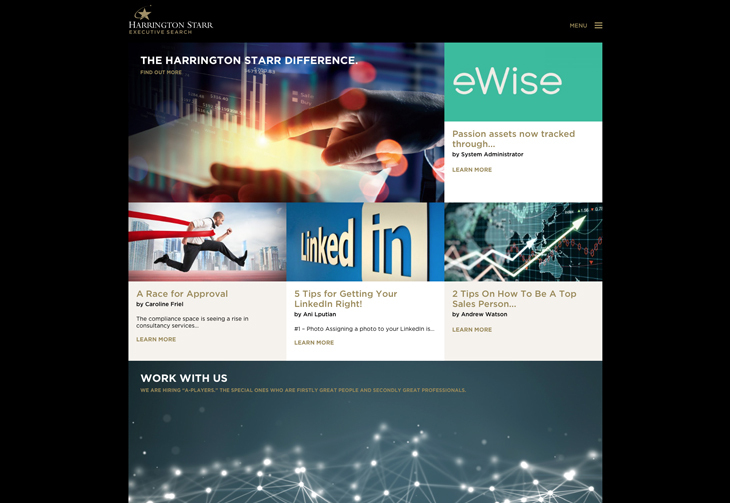 Recently launched website for the Wellington College Community Office which aims to facilitate social, career and business opportunities for all members of the Wellington Community by delivering a vibrant events and communications programme, as well as providing information on and opportunities to support the development of the College. Bespoke Wordpress theme website for a firm of Executive Search Consultants working in the financial services sector. With a focus on industry white papers and insights, the site is an important resource for specialist market intelligence. 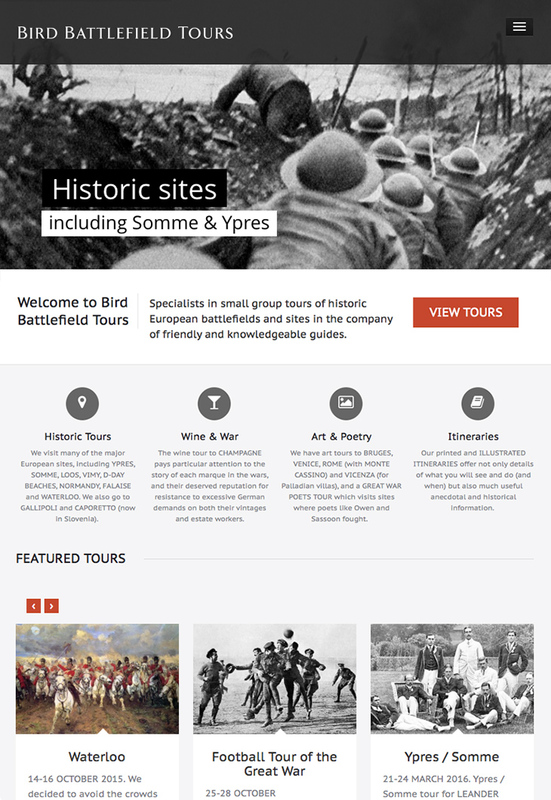 Fully responsive Wordpress theme site for a specialist battlefield tour operator. Fully responsive Wordpress theme Pie-site for Monty Pieman – an artisan maker of delicious, gourmet pies – something a little bit different! The recently launched, fully responsive website for Tonbridge School’s Excellence for All campaign provides an overview of the campaign and the facility for online donations. 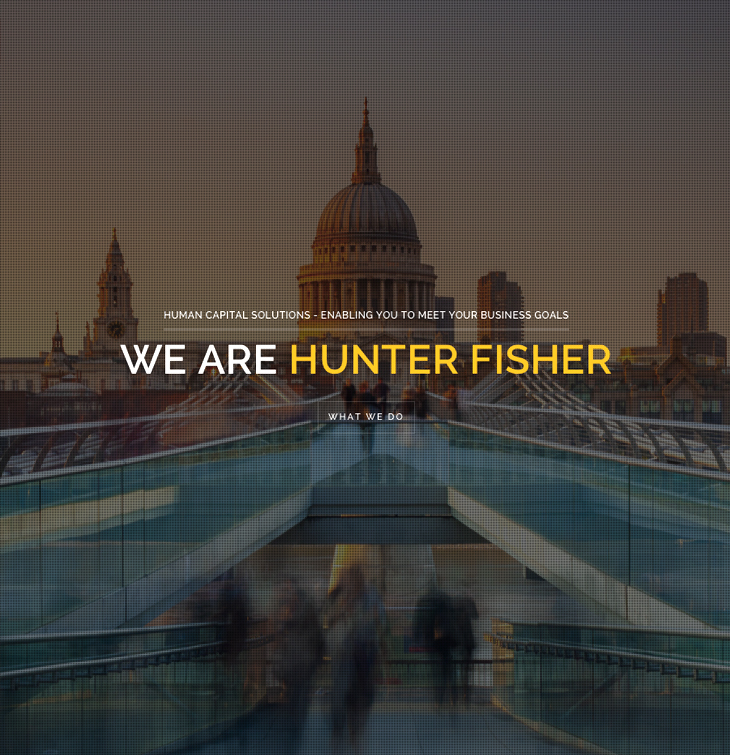 Fully responsive and retina ready Wordpress theme website for Hunter Fisher executive search consultants. Aktrion Group is an international business and manufacturing support services provider. The company offers expertise across numerous sectors which needs to be reflected online. Our solution was to design and build a WordPress Network which allows for a Group site, plus four sector sites that cross-share content and posts via a single WordPress dashboard. 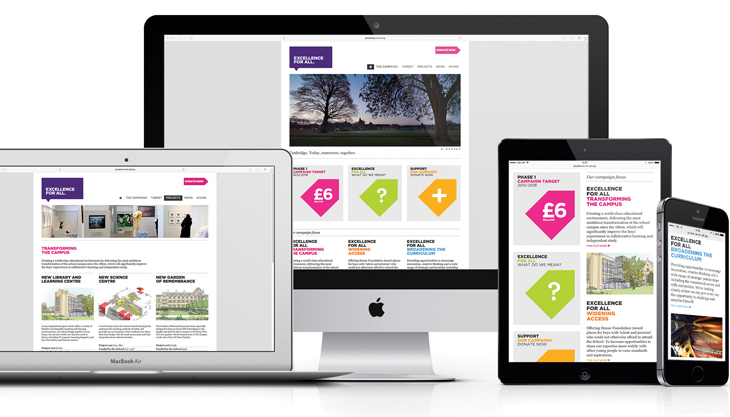 The design of each site uses a universal theme with each sector site utilising its brand colour, creating a consistent brand presence across all sites. 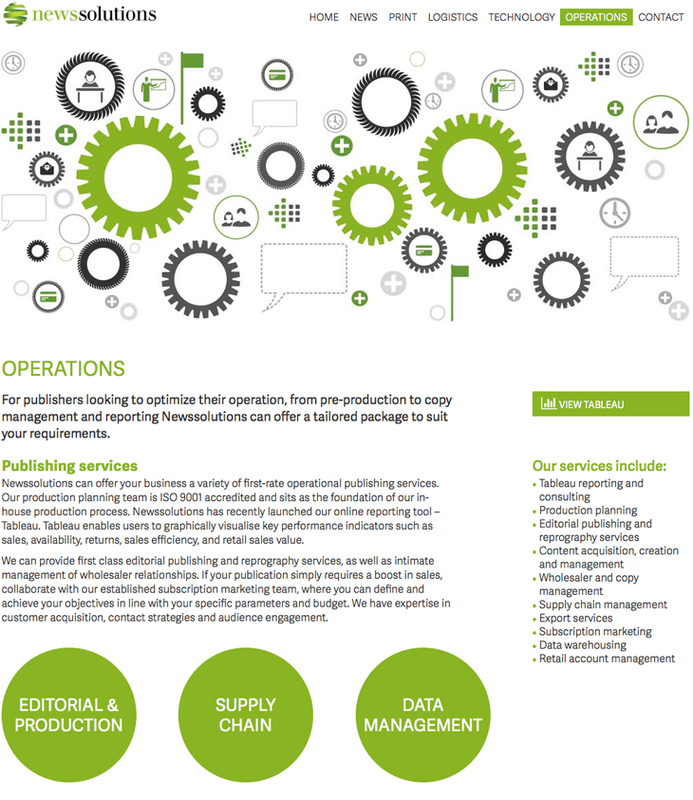 News Solutions, part of News UK, delivers tailored solutions to print, digital and distribution markets. The brief was to design and build a simple snapshot of the business. We built upon their existing brand illustrative style and colour palette to deliver a striking and simple responsive site. Animations and visual effects bring interest to the site. The client has built an innovative adaptation of WordPress VIP within their own environment so the build was carried out to their own specification. 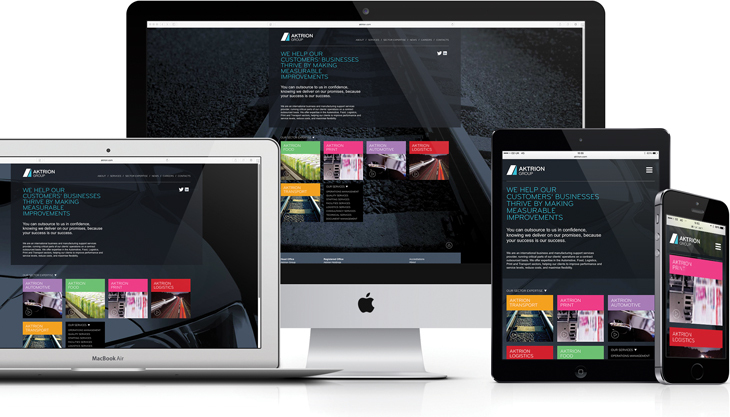 Design and build of a fully responsive website for Aspire Graphics, a large format digital print company. 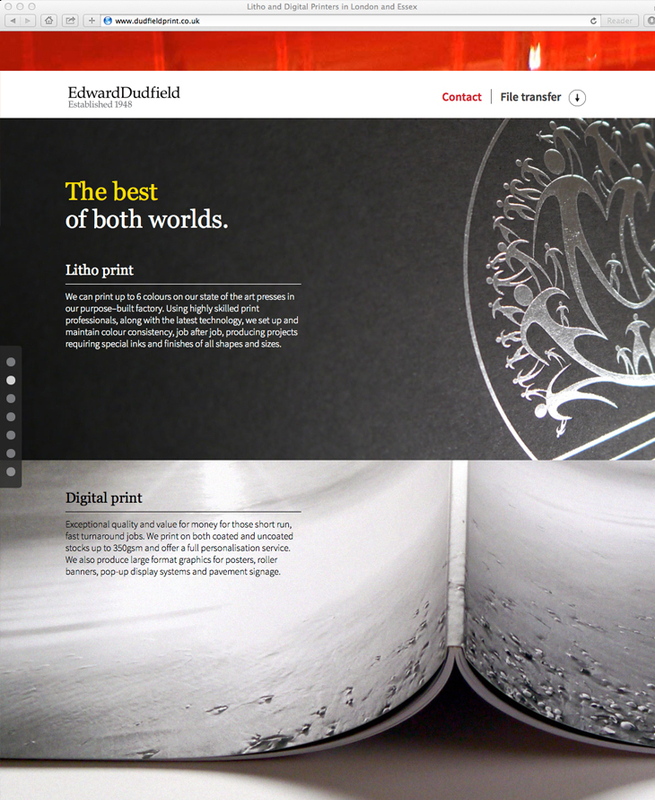 Website for Edward Dudfield, a high quality printer based in Ilford. Built in Wordpress, it is a simple, vertically scrolling site with large background images, providing a stunningly visual environment in which to showcase their work and services. quick and easy posting of current news items and club events. 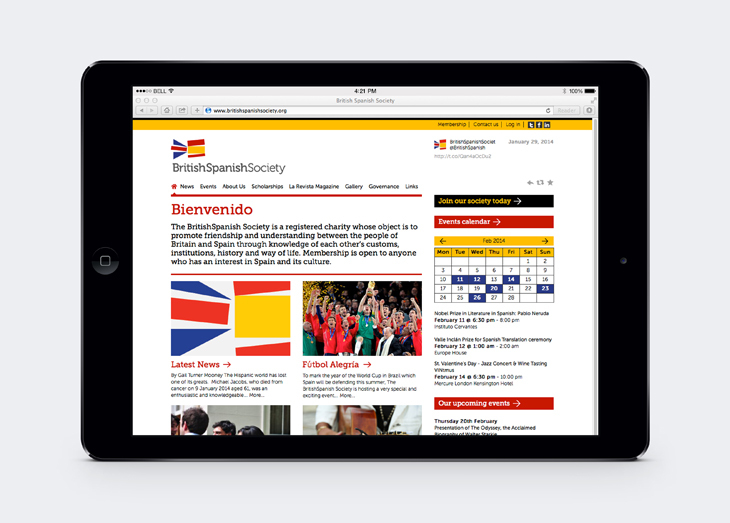 Completely user-friendly and engaging site for the British Spanish Society. Everything is accessible from the homepage with online event bookings, membership payments and easy access to social media. The full CMS allows them to easily update and keep the content fresh. We worked with the team at NI to design an intuitive intranet site which fulfilled the brief of it being the number one resource for everyone at NI. Our approach is based upon all elements of the intranet being 'app' based features, and, in so doing, removing the need for a traditional navigation system. Website which showcases Jigsaw Colour’s most recent and best litho print projects. The concept of the site is bold simplicity. Key statements position them as the printer of choice for the design industry and detailed photography highlights the finer details of their work. Photography was art directed, shot and retouched in-house, which gave us total creative control of the entire site. Alongside the site we have also designed and built an e-campaign to inform clients of the new site launch and ongoing monthly news. Feel free to visit the site at www.jigsawcolour.co.uk. Fully content-managed site that enables Brockway to add new carpet ranges, list all stockists, respond to all enquiries and send and track sample cuttings. Feel free to visit the site at www.brockway.co.uk. Raising awareness of the brand, designed to appeal to interior designers and the design-savvy consumer. Europe Arab Bank plc (EAB) is the start-up European operation and wholly-owned subsidiary of Arab Bank, one of the largest financial institutions in the Middle East. 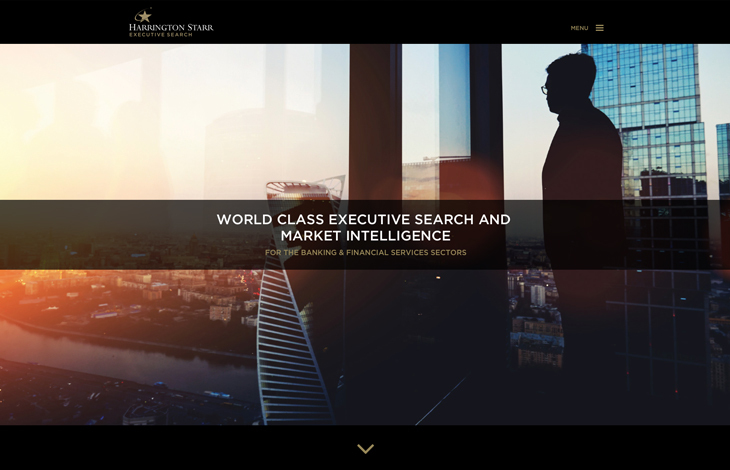 The website (developed in conjunction with strategic brand consultants Gabriel Research & Management) had to appeal to clients in both Europe and MENA, and be viewed in five languages. KX, pronounced 'kickz', represents a way of life, where health meets lifestyle. KX is an exclusive private health club in Chelsea and is regarded as the flagship for the KX brand. 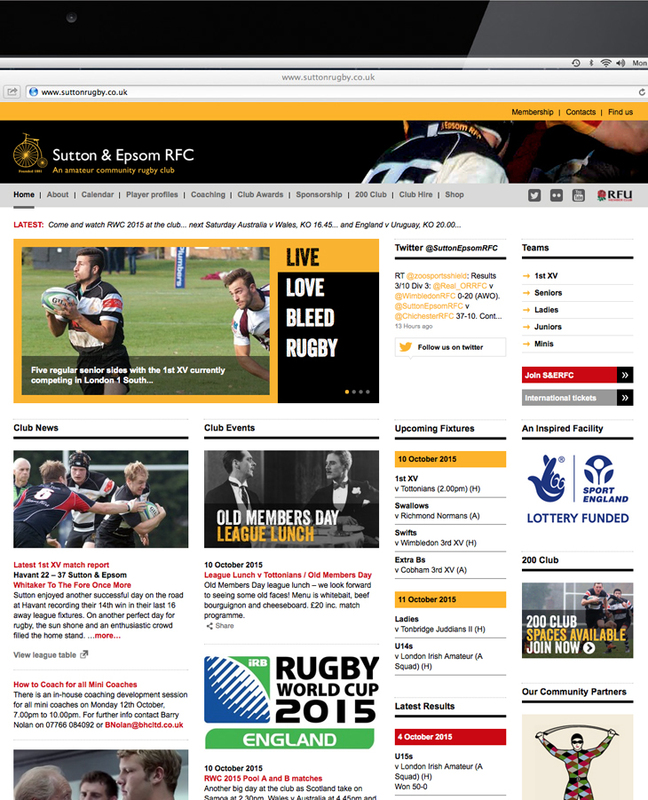 The website is a members only site which is updated each month with latest news, class timetable and club announcements. Digital presenter for this firm of interior designers and architects to showcase their stunning portfolio of work. a professional conference organiser specialising in high quality event management. Flash animation to highlight the opening of this refurbished Workspace Group office development in Chiswick. Run by retailers for retailers, Skillsmart Retail is part of the Skills for Business Network and aims to be the authority for retail skills development and promotion, contributing to improved productivity throughout the industry. The key factor in re-designing the website was how to simplify what is a massive site in terms of content and available downloads. The first hurdle was to rationalise the home page by creating four key 'entry points' relevant to each particular audience. The result is a completely user-friendly site containing a wealth of information that is easily navigated and updateable through a bespoke content management system. Website for Weston Williamson – a well established architectural practice based in London Bridge who specialise in transport and urban design projects, with an extensive portfolio including projects such as Crossrail and the Jubilee Line Extension at London Bridge. A simple idea for an e-shot moving card. Situated in Chancery Lane, WC2 - right in the heartland of the legal profession - Quality Court offers high specification, fully serviced office accommodation. As well as a stunning gallery of images, the website contained interactive floorplans to aid the sales process. Website for the Diploma in Retail Business – a new qualification that combines theoretical study with practical experience and is part of the national 14-19 Reform Programme. The Diploma in Retail Business will place retail and its supply chain on the educational map and every young person in England will be entitled to study the Diploma in Retail Business from 2013. It will provide the skills, understanding and motivation that employers need in new recruits.